LED Engin is uniquely positioned for custom level 1 and level 2 LED solutions. 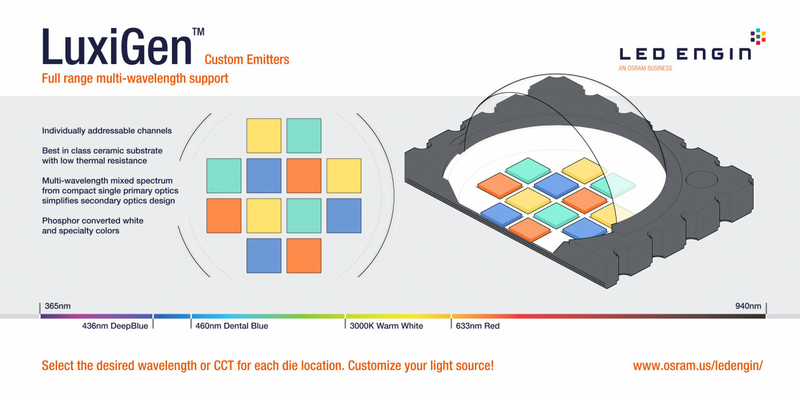 The LuxiGenTM platform of LED emitters have been deployed in many niche applications - from light sources for dental wands to medical equipment, from industrial lighting for breweries to industrial devices for auto wheel alignment, from chandeliers in historical buildings to planetarium projectors. Customization enables the design flexibility that these applications demand and that most manufacturers of LEDs cannot support. In addition to our standard products, LED Engin offers custom color options tailored to specific needs and applications. For enquiries about custom emitters, please use the Contact Us link at the bottom of this page.